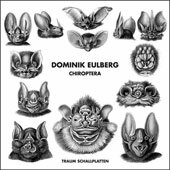 The ambassador of the bat, yes it is true, and the ambassador of German melodic techno music Dominik Eulberg is releasing, 8 months after „Ein Stuckchen Urstoff“, a new EP on Traum. Fans of his music can anticipate another masterpiece of melodic music, which is based on him fiddling with sounds, acoustics… keeping up of what we refer to as the ‚Eulbergsche’ language. This time it seems to be even more exhilarated and driven by passion. Does this make sense when you speak about someone who is considered to have great compositional skill? Yes we think the liveliness shows up in greater chunks, and the crispiness of the ideas rise to a point which is exceptional and... for those who seek techno realism… it can be found here as well. There are very few tech artists in comparison worldwide who have made their hobby influence their musical career to such an extent. This concerns his almost scientistic approach to music, his patience and his belief that only things that have become accepted (after 1000 listening sessions of his) are worth to be released. Eulberg has recently devoted a part of his life to the small creature "bat. These get killed by hundreds every week by electricity generating eco friendly windmills... not only in the Westerwald. So it was time to give these nice little creatures a home with this release. The new EP does not want to put out a message criticizing these new ways of generating electricity while destroying wildlife, but as always Eulberg is poking positively at nature and shows its variety through a complex composition of dazzling colors and an interaction of great diverse melodies. The "Schokoladen Fruchtzwerg" (eng. Chocolate Fruitmidgit) is a choreographic masterpiece of a track and as someone said, it is a true piece of Eulberg. The track starts with an amazing 2 minute long intro hat includes a lot of glitch sounds and a firework of rhythm elements being gunned out… all seemingly being the result of a free association. This passage builds up tension to a simmering... keeping it all alive but anticipates the coming change. After the intro the track bursts in to what tends out to be a "tour de force" of complex melody passages and changing rhythm patterns. Eulberg combines here elements from electronic, techno and house that captivates the listener beyond the dance floors as well as the ambitious DJ. It is the genius in Dominik Eulberg which makes it possible that a complex composition such as this, seems so natural... seems almost played live. The flow of "Schokoladen Fruchtzwerg" shows this goes way beyond the DJ culture as we know it. On the other side it is not resulting in an obscurity but to the opposite... is still accessible and hugely enjoyable. The cinematic 3-D feel of the recording and its superb quality connect to his highly appraised track "Offenbach" which was released on his last EP. The "Schokoladen Fruchtzwerg" is an example for futuristic quality techno music in 2013. Das Kleine Mausohr (eng. the mouse eared bat-Myotis or the little mouse ear) refers according to its name to a small bat, nevertheless is the second largest bat of its group... it is extremely mobile and extremely good at flying low. So it does not surprise that Eulberg here creates melodies that move with the speed of light, while these melodies entwine around each other in a cannibalistic fashion but never end up in any kind of acoustic stranglehold, instead celebrate their wealth and richness. The track starts with building up quite a lot of energy from the beginning. It pulls you into it. Somehow that energy is condensed and accumulated before it all is channeled into a great break full of joy and emotions. A unique break that is quite independent from the previous sounds, is very much on its own and mangoes to attract good energy. In contrast to the a-side track "Schokoladen Fruchtzwerg" "Das Kleine Mausohr" acts up much more as an techno track that can serve as a perfect "audio illustration" of a rave in a wildlife/nature resort. The track has a highly enthusiastic inner core and it seems whatever happens music wise is carried by it. It seems there is nothing in the world that can stop its direction. The "Große Hufeisennase" track is written in the tradition of "Metamorphose" from Dominik’s album "Diorama". The track is a result of a private and intimate situation, very much aside of his hectic DJ live. It dedicates itself to no conventions. The track is based on sugary melodies which meet strong beats. Here rhythms and melodies are 100% contrary to each other. As a bonus on the digital version there will be an ambient version oft he track! This track could be a good one for the people who liked his "Diorama" Album!